Hot Tamale Rose (Rosa “Hot Tamale”) - Hot Tamale Rose Flower Essence supports being grounded and centered while riding the chaos and the potential of the transformational roller coaster into the jumble, tumble years ahead. It is time coded to support your body/mind as you adjust to shifting frequencies. This miniature hybrid rose sports tiny firey orange/yellow/pink blossoms. Feeling woozy, uncentered, ungrounded, overloaded and discombobulated by the speed and chaos in your personal life. Sensing/feeling the chaos and upheaval in the world. Having difficulty adapting to rapid change. 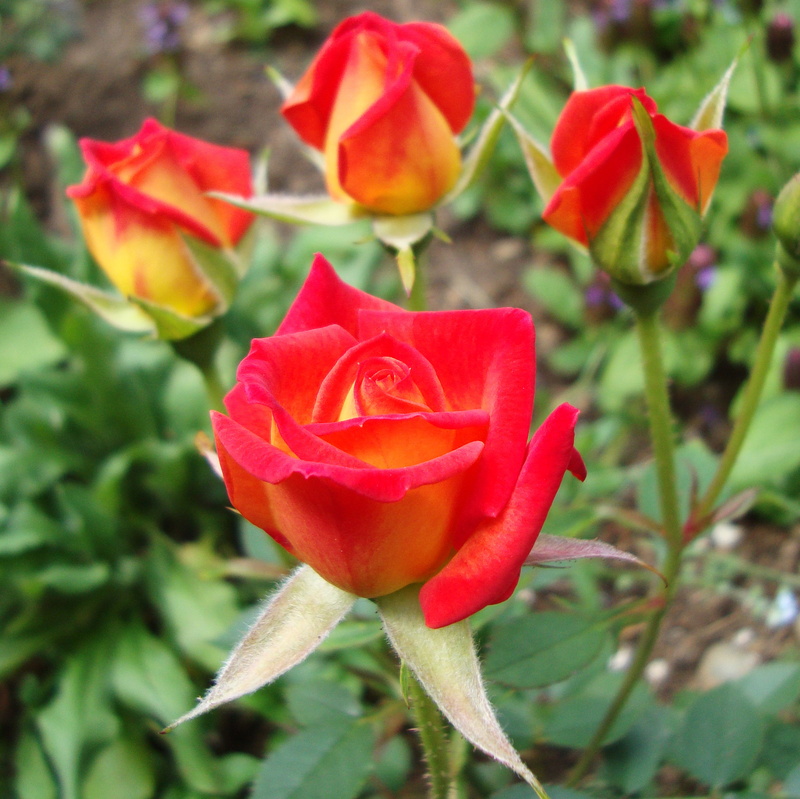 Hot Tamale Rose helps you stay grounded, centered and functional while you ride your personal transformational process and the human collective evolutionary process. It is time coded to sync your body/mind with rapidly changing human, Earth and Universal frequencies. This helps you to feel more stable in your body and reach for your full heart-centered potential. This essence was made by the “no-pick” method. While the essence was being made, crystals of amber, carnelian, drusy quartz, fire agate, Herkimer diamond, icosahedron cut quartz, mango calcite, Peruvian pink opal, red jasper, rhodonite, rose quartz, stibnite, and vanadinite were placed among the plants with the storage (mother) bottles. The sun acts as a transformer to step down spiritual energies from higher dimensions. While the essence was being made, Amber acted as a lens to receive and focus sunlight for this purpose. It aligns the subtle bodies with the physical bodies, transmutes negative energy into positive energy, and emits a sunny and soothing energy that calms and enlivens the disposition. Carnelian unites physical vitality with courage and confidence to embrace transformation in your life. Drusy quartz crystals energize and stabilize your subtle bodies. Fire agate initiates waking up from the sleep of living a safe routine life and inspires a zest for living authentically and passionately with joy. Herkimer diamond, as a manifestation of solidified spiritual light, takes you as far as you can go toward the highest octave of Spirit while staying in your physical body on Earth. It also enhances the properties of other stones. Icosahedron cut quartz has 20 (5X4) equilateral sides. It is a bridge between the 5th Dimension - the entry into the unified Spiritual realms - and the 4 cardinal directions (N, S, E, W) on Earth. Mangano calcite brings peace, serenity, tranquility and well-being. It enhances the energy flow through the crown, third eye, throat and heart chakras. Peruvian pink opal clears and calms the heart and brings a sense of peace and tranquility. Red jasper instills physical vitality, emotional balance and zest for life. Rhodonite carries the qualities of love, compassion, and generosity. It supports you to recognize and clarify your gifts, and to use them for the highest good in service to others and our Mother Earth. Rose quartz encourages gentleness, emotional healing, and uniting with the Divine; it shifts your body from a stress-based physiology to a higher frequency Love-based physiology. Stibnite helps you to assimilate high frequency energy into your body and complete your energy circuit with the Earth. Vanadinite creates a direct link to Earth energies and helps you to creatively enjoy the experience of being in a physical body. The actions of the crystals inform the way this flower essence seats into the physical body. While the Hot Tamale Rose Flower Essence was being made, the sound of rattle and spirit song coming through Diana’s voice was imprinted into the essence.